New „hardwired“ TCP/IP chip from company Wiznet resists attacks, it´s fast and consumes only a minimum energy and host MCU resources. TCP/IP solutions from company Wiznet are known by its resistance resulting already from their principle . all the solution is hardware-based, thus it´s not possible to change a basic functionality of a device (flooding, spoofing, …). 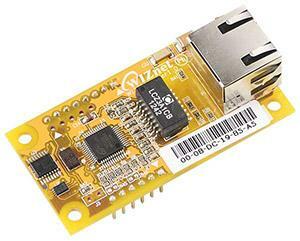 W5500 outstands by its “modesty” – it only requires a few GPIO pins of a host MCU – thanks to a high speed SPI interface (up to 80 MHz) and it also has a very low power consumption. A result of a small consumption is, that the chip heats up to approx. 40´C at a common operation, in contrast to other similar chips, which usually have 60-70´C at operation. This naturally means a higher reliability, possibility of a more dense placing of components and elimination of problems with overheating of a device built-in into a small enclosure.